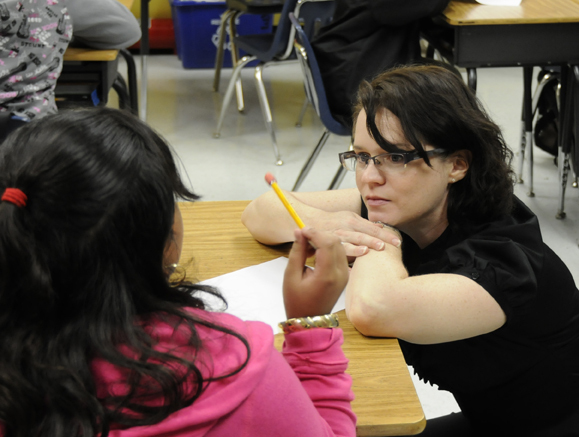 Tria Wood discusses a poem with a WITS 4th grade student. In 1983, Jane Creighton visited my 7th grade classroom in Edna, Texas, under the Artists and Writers program, using a model similar to the one WITS uses today. It was her visits in particular that made me decide that I wanted to be a writer. I joined the WITS team as a writer in 2005 and have been teaching for WITS ever since. So many of my students have come to me with poems or stories that they’ve written on their own because they’re so excited about writing since I’ve visited their classrooms through WITS. I love those moments when I can see that I’m passing the love of words on to them the way Jane Creighton did for me. I feel like I learn as much from my students as they learn from me. These young writers inspire me every day with their creativity and enthusiasm. I’ve felt more “at home” working for WITS than in any other job I’ve held. This summer Tria will teach with WITS at the Summer Creative Writing Workshops. * If you were involved in WITS as a student, parent, writer, teacher or staff member, let us know in the comment section. We would love to do a “Where Are We Now” post about you.